Let’s face it… Insurance can be confusing. If you have ever tried to get a quote, understand a complex policy to make sure it covers you enough or simply make a claim for reimbursement, you may know that it can be a frustrating experience — especially if you belong to Generation Y (also known as Millennials). According to the World Insurance Report 2016 made by Capgemini and Efma, Generation Y interacts with their insurer twice as much as any other age group across all channels, and they prefer to use digital means for these interactions 2.5x more. The report also recommends that insurers strengthen their connection to Generation Y customers by making it as easy as possible for them to do so. Insurance companies are usually perceived as a big, not agile and slow moving organizations. Very few insurances have been willing to improve the over all customer experiences in the past. However, this may be evolving now. A great online user experience is a must for long-term insurer viability. I would like to share a personal experience that will, I hope, demonstrate the customer service problem that insurance companies will need to solve in order to meet the needs of Generation Y.
I have made several claims for reimbursement in my life and, generally, I’ve never had a good experience. As a customer, I mostly felt ignored and trapped in a complicated and never-ending process, especially when I requested reimbursement for a missed flight with Vueling Airlines (using Europ Assistance insurance company) — but that’s a story for another day. Boarding and payment processes were in most cases well designed — easy & smooth. Subsequent touch-points, unfortunately, not as much. It always seemed like the strategy of insurance companies is to get paid quickly and de-prioritize the customer service that follows. Note: The following story is not a complaint. Rather, it is an account of my experience with insurance4carhire insurance company. In 2014, I went to Madeira island for vacation, where we rented a car to travel around easily. If you have rented a car you know it is better to get insurance — to protect you from paying extra for damages that may occur. This time I decided to get covered by insurance somewhere other than the car rental company. I discovered a company called insurance4carhire that helped me to avoid paying overpriced fees on the airport, and it was possible to order online. Unfortunately, I scratched the car while parking in a very old, narrow street. So it was very fortunate for me that I was covered. At the airport I paid 150 EUR, which the rental staff estimated was the compensation for the damage. When I returned home, the reimbursement adventure started by me contacting the insurance company. My choices were snail mail or email. A chain of email messages ensued as I scrambled to provide everything they needed to process my claim. The most painful part of this experience was gathering all attachments in one place so I could reply with one single email message. I was doing my best to make all clear and understandable, but it’s hard to avoid small mistakes. Some of the attachments were photos I took with my phone, and the rest were on my computer desktop or in my mail box. To collect everything in one place, I sent them to myself by email. After all this, I was asked to provide documents that I had missed from the claim form. I replied, returning the documents they asked for. The Claims Department and I went back-and-forth like this several times before they finally had everything they needed. Later on, I realized that so many email exchanges made the messages excessively cluttered. Some attachments were even delivered at the beginning but overlooked by the Claims Department. I stayed calm, and I provided everything they asked for again. Alright — we made it, but then I asked myself: “Does communication have to be so difficult?” I believe this correspondence could have been done much more easily. This experience showed me first-hand the problems that insurance companies have in customer communication. Drawing from my experience as a UX Designer, I identified several areas where big improvement could be made. In the following article, I will describe the problem and how I would approach solving it. To eliminate overly-complicated information exchange with insurers (e.g. reimbursement correspondence). To make it more accessible and usable for Generation Y based on how they are used to communicating today and using advanced technology to seamlessly personalize the user experience. The following are problems that I have identified based on my personal experience with insurance companies. These same experiences have inspired me to think about how these problems could be solved. In addition, I have supplemented my subjective view with research (mentioned above) in order to present these issues objectively. * Some things need be to done with a smartphone (taking photos), some things need to be done with a computer (filling out the claim form), etc. I understand that reimbursement — returning money to the customer — is not a top priority for insurers. But the overall customer experience does count when talking about business in the long run. Ernest and Young also recommended, early in 2015, that insurers must embrace digital to improve poor customer relationships, for instance by establishing more digital options for consumers and being “easy to deal with” by offering relevant and timely solutions during critical interactions, like reimbursement. To solve the problems described above, I decided to propose a new concept. This is a brief example of how the correspondence concept could work. Note: This process covers only the portion of correspondence when some documents are overlooked or lost and the customer is asked to re-send them. It does not cover the whole claim process. The user receives a mobile notification asking him or her to complete the missing supporting documents. A wizard leads the user through the interface step by step to provide all necessary attachments. Documents already accepted by the insurance company could be displayed to reinforce the communication. * The user has full freedom to start on the mobile phone (taking pictures) and continue on the computer attaching other documents without losing any data. The user replies with all previously missing or updated attachments. The user is asked to review the claim status once it is ready. Design is conformed to Generation Y. Offering users better and more accessible UX will make user happy as well. * Users can interact on various devices and engage across many channels to complete one single activity. * Example: A customer starts the activity (file the claim) on a tablet or phone, taking pictures, and finishing at home on the computer to gather other documents. This concept is my own experiment to explore the needs of modern Generation Y when interacting with old-school insurance companies. My main intention is to uncover room for improvement in today’s customer experience, which is more dynamic and interconnected than ever before. The concept does not cover all necessary touch-points but rather aims to demonstrate the need to increase ease of use and reduce the clutter that comes with regular mail or long email exchanges. 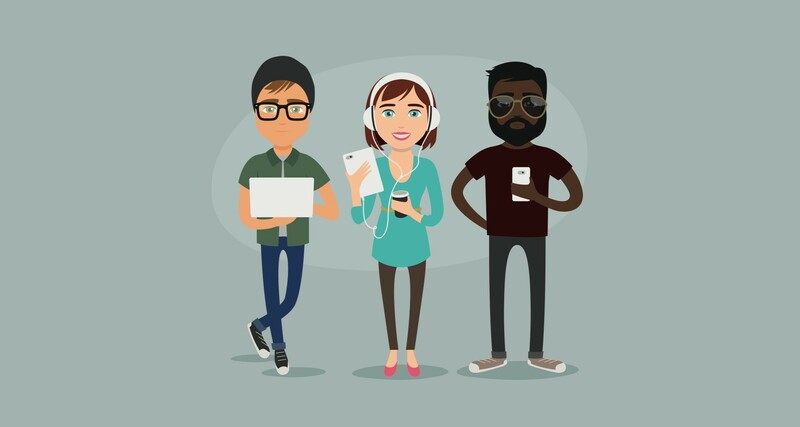 This concept fully conforms to the way users of Generation Y are accustomed to interacting and communicating. For this experiment I have used a Dynamic Communications technology (by Quadient — formerly GMC Software), to compose a functional prototype demonstrating the idea. The information in this article is my own and it may not necessarily reflect the views of my employer — Quadient (formerly GMC Software).